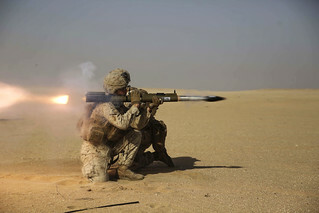 A Marine with Company A, 1st Battalion, 5th Marine Regiment the 15th Marine Expeditionary Unit's Ground Combat Element, fires an M72A7 rocket launcher during a familiarization course. This course offered Marines the opportunity to experience firing shoulder fired rocket launchers, Oct. 23, 2017. The 15th MEU is embarked on the America Amphibious Ready Group and is deployed to maintain regional security in the U.S. 5th Fleet area of operations.